Sticking with Stratford, our local Architectural Conservancy Ontario branch has just heard that the branch’s nomination of the city of Stratford for induction into the North America Railway Hall of Fame has been accepted. Hooray! The induction will happen in St. Thomas, Ontario — the home of the NARHF — later this month. Stratford was nominated for its amazing railway history and heritage, touched on in last month’s post. 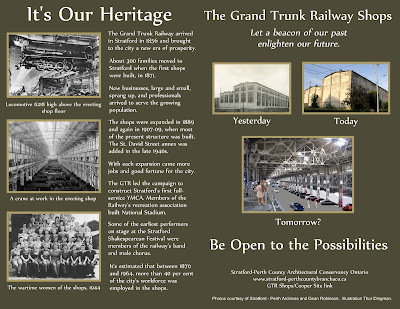 The Stratford Festival of its day, the railway, and the need to keep it running, really put Stratford on the map. The induction of Stratford represents a great honour; but, just to be clear, the honour is for Stratford as a small “c” city, for the place, not for its municipal government. It seems that, from the standpoint of preserving its railway (and other) heritage, Stratford city councils are — putting it kindly — not always at the forefront in terms of vision and commitment. Remember the old story from last time about the Canadian Pacific Railway wanting to destroy the city’s parks system for a railway line? The mayor and all but a few councillors were gung ho and had it been left to them…. But fortunately the question was put to Stratford residents who defeated it in a 1913 referendum. Today, the biggest preservation challenge facing Stratford is the gigantic locomotive repair shops building on a huge city-owned site (known locally as the Cooper Site) adjacent to the downtown. While the building moulders… and moulders… councillors and city administrators dither… and dither. Yo, where’s the mojo to finally get something going here? 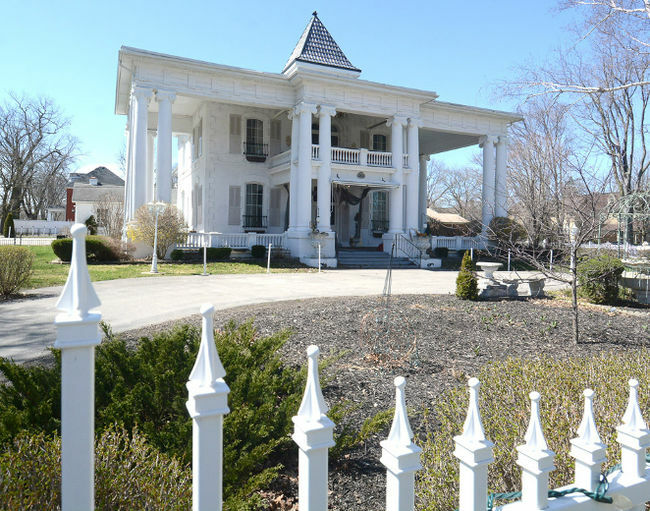 Another telling example of the current council’s interest (or lack thereof) in Stratford’s built heritage is the still-unfolding case of the White House. The White House: a very big old house on a highly visible corner lot on one of the most historic and beautiful streets in the city. The current owners want to subdivide it creating three new lots squeezed in behind, beside, and partly in front of the grand porticoed front. They say they can’t afford to maintain the house without infill development. The 1866 property is neither designated under the OHA nor formally listed, although it does appear to be included on an old inventory. And Heritage Stratford, the city’s appointed heritage committee, had prepared a draft designation by-law in 2005 (not coincidentally the last time the property was at risk). When the applications for severance into four lots and accompanying minor variances went forward, the city’s committee of adjustment turned them down, partly on heritage grounds. 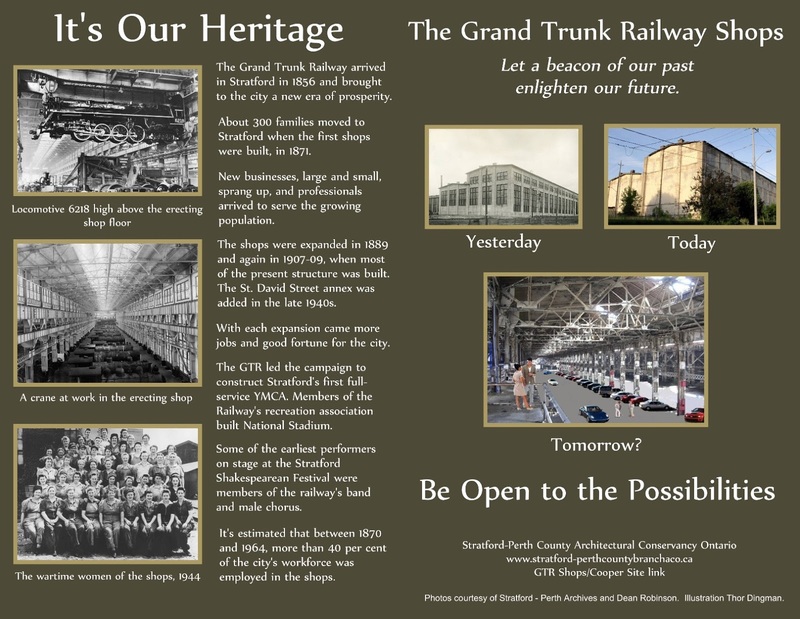 This despite the fact that city planning staff had recommended the scheme… making no mention of heritage (seriously!). Understandably the owner appealed the decision to the Ontario Municipal Board. And, wouldn’t you guess, subpoenaed the city’s planner as an expert witness to help make its case. The city was faced with an awkward choice — whether to side with its own committee or with its staff. At first it dithered. But after a campaign by the neighbourhood Friends of the Stratford White House group urging the city to step up (which included an impassioned plea from renowned Stratford actor Seana McKenna), councillors decided the city would be represented at the OMB hearing and would retain independent legal and planning advice. But… something happened on the way to the hearing, and in the end (after an in camera discussion) council backtracked, opting not to take part in the hearing one way or the other. This left the neighbourhood group as the only party fighting the appeal. Meantime, the owner, whose proposal for the property originally included retaining the house, applied for a demolition permit. Yikes! As they didn’t abandon the OMB appeal it seemed like a strategic move, part of a “plan B” in case the OMB decision did not go their way. To its credit, Heritage Stratford responded very quickly, recommending that the city designate the property under Part IV of the Ontario Heritage Act. (This uncharacteristic dexterity made possible by the groundwork done in 2005). The recommendation went forward and a subcommittee of council narrowly passed a motion to designate. Then — and this was the very week the Ontario Heritage Conference came to town! — council’s planning and heritage committee debated the designation recommendation. It was painful to watch. Perhaps because this council has so rarely considered heritage designations (yes, that’s a dig), there was confusion about how the designation process worked, what exactly was required and what the implications were for the property owner. The staff tried to explain but just seemed to muddy things more. One particular low point was when a motion was made to retain “independent” advice on the importance of the property, suggesting the opinion some councillors held of Heritage Stratford, their appointed heritage committee. Ouch. Fortunately that was defeated. One councillor said, apparently proudly, that Stratford had never designated without the owner’s consent and “I don’t want to be part of the first council that does it.” Another called it a “draconian measure.” Oy vey. No one bothered to explain that objections to designation, where they occur, are just part of the process; nor that the Conservation Review Board hears objections and prepares a report but that the municipal council makes the final decision on whether to designate or not. No one apparently considered the court ruling that a practice of not designating without the owner’s consent is beyond a municipality’s powers under the OHA. Nor the fact that other nearby places — like St. Marys — have designated property over an owner’s objections. No one thought to raise the matter of incentives, such as grants or property tax relief, that might be made available to the property owner. Nor that designation does not “freeze” a property and would allow for approval of a more sensitive redevelopment plan in future (and might actually hasten it). The motion to designate was defeated 7-3. Council later buried the matter without a word. Again, one of Stratford’s most prominent and interesting old houses! For a city that brands itself as a centre for culture and heritage it was an astonishing result. Where does the story go from here? I’m not sure, but one piece fell into place last week with the release of the OMB decision on the severance/minor variance issues. Watch this space.